Though I shop in the 99p Store fairly regularly, I tend to think I’ve done it wrong if the bill comes to more than a fiver. So I was kind of taken aback when the 99p Store dudes wanted to give us a voucher to spend £50 in the shop. Are you sure guys? I like Toblerone but there’s only so many batteries we can use. I think the point of this mission was to challenge us to discover parts of 99p Stores that we never would have discovered otherwise. Discount stores like this are the success stories of the recession – as other shops go out of business, they’re flourishing as we all try and make our money go that bit further. The company recently announced plans to open 100 more stores, creating 3,000 new jobs. Fittingly, our local 99p Store, on London Road in Brighton, is in premises that used to house the late lamented Woolworths. We arrived for our mega shop on the first Monday morning of the school holidays. I’d thought that it would be quiet but not at all, it was heaving – all around us families were stocking up on footballs, toys and snacks to get them through the holidays. 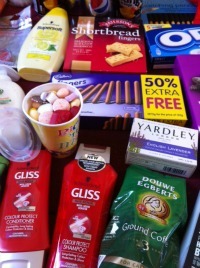 So we started with our usual haunts of the sweets and stationery aisles, then went off piste with a sweep of the toiletries, pet food and other departments. We burned through our £50 voucher pretty easily with gifts for all the family. Here’s our haul. The revelation for me was the health & beauty aisle. I have been shopping in this store for years and never even been down this aisle. Turns out they sell condoms! Who knew? I wasn’t brave enough to invest in those, though if they did prove to be less than reliable then they sell pregnancy tests as well. What I really like about discount stores like this is that it’s a bit like shopping in a supermarket abroad – many of the brands are familiar but the actual products are often slightly unusual. Like the Yoghurt & Lime Shampoo. Surely that’s got to count as one of your five a day? Cup of Pick n Mix sweets for 99p – enough to last my kids through a whole film with some left over. Probably would’ve cost at least £3 at the cinema. Douwe Egberts coffee – that’s posh, right? 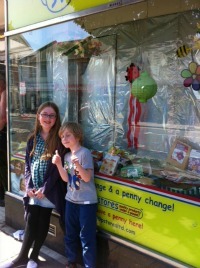 We also liked that they had a charity box tucked next to the till, stuffed with 1ps which people had left behind. I don’t know if this is something they do in all 99p stores but I hope so because it could add up to a pretty hefty donation. And I think the moral of the story is to make sure you look in ALL the aisles of the 99p Store, cos there are some pretty hefty bargains lurking. 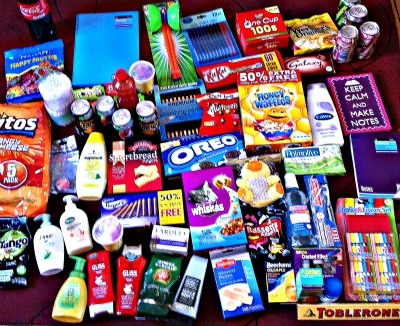 Disclosure: As discussed above, we were provided with a £50 voucher in order to review 99p Stores. We will be doing more reviews like this on an ongoing basis and may be meeting the King of 99p Stores so watch this space. We have not received any other payment.